I fully understand the need for minimizing the illegal copying practices of music, movies and TV series, but come on! You should be able to watch the movie you purchased on your TV or any other non-Apple device!? Isn’t this kind of protection promoting illegal downloads …? After all those would be free and come with zero hassle …!? In this article I’ll show you how you can remove iTunes DRM from your legally bought iTunes movies for Windows. 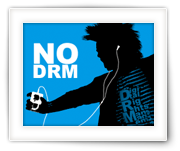 MacOS X users should read the “MacOS X – How to remove DRM from iTunes movies” article. This article is not intended to promote pirating Copyrighted Materials! Laws, when it comes to copying Copyrighted materials, differ from country to country. It is your responsibility to be aware of these laws and comply to them. See also our Disclaimer! The movie industry in general does not want you to copy a DVD for any reason. Fair use proponents however claim that the law leaves room for making a private backup (in the US: DMCA or Digital Millenium Copyright Act). But it’s all a matter of interpretation – so think for yourself before you act! Other countries, like The Netherlands, are more liberal when it comes to this – Consumers pay a few cents extra for empty media, and for personal use you are allowed to make a copy (see Stichting Thuiskopie). In all my searches I did not find any freeware or open source software that could do remove iTunes DRM. There used to be (still available) a program called Requiem, but it requires an old iTunes version and does not support HD (720p or 1080p) movies or TV-Shows. An alternative used to be so called screen capture video recorders, but that leak has been plugged by Apple as well, so I have not been able to find a working version for that either. What I did find however is a boat load of commercial “DRM removers” and the wide selection of names for the same program makes it confusing for sure. The most commonly used tool seems to be a program called NoteBurner M4V Converter – which also comes in a extended version named NoteBurner M4V Converter Plus. The later offers to remove iTunes DRM from rented movies and TV-Series as well, which makes it in my opinion questionable at best when it comes legalities. You’d be able to “rent” a movie and watch it for an unlimited number of times, and that’s not the intend of a rental. Here again though … if I’d be allowed to play the rental on my XBMC box, then we wouldn’t be having this conversation. Note : Amazon used to be a good alternative, but recently (summer 2013) Amazon broke the ability to play rentals and purchased movies and TV Series on your XBMC box as well. Also note that when I say XBMC box, I do not just mean my XBMC box, but also Boxee Box, Android devices, TV’s with playback from USB drives, etc. NoteBurner M4V Converter is for sale at $39.95, and Plus version runs you $49.95. A trial version (doing only a few minutes of each movie) is available though for you to test the quality. Personally, I think it’s a little expensive and if you’re looking at doing this for only a hand full of movies then it’s maybe a better idea to just buy the DVD or BluRay disc and use one of our DVD or BluRay Ripping Guides to rip those discs. Also keep in mind that methods like these might not work with future iTunes version – Apple might find a way to prevent this method from working. After downloading and installing NoteBurner (I recommend you start with the Trial version first), the process to remove iTunes DRM will be super easy. Note : Screenshots are based on NoteBurner Plus Trial version for Windows. The Mac version looks very different. In the lower left corner click “Output Format” to select your output format. A long list of different devices are available, anywhere from original format, several Apple devices, Android devices, cell phones, PDA’s, XBox 360, PS3, etc. Simply pick what device you’d like to use for playback. Note : if your device is not in the list, then you can either choose “Same as the Source for MP4”, “Customized MP4 Movie”, a similar device, or even look under the cogs group for formats like 3GP, AVI, WMV, MPEG 1 or 2, VOB, etc. The big missing format though is MKV … maybe future versions will include this format as well. The next step is pretty obvious: select the movie(s) and/or TV-Show(s) you’d like to have remove iTunes DRM from. 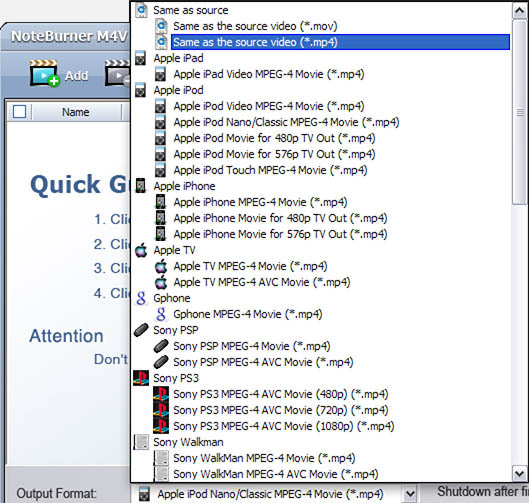 NoteBurner does have batch capabilities so you can add more than one Movie and/or TV Show. Click the “Add” button to see what’s available in your iTunes. 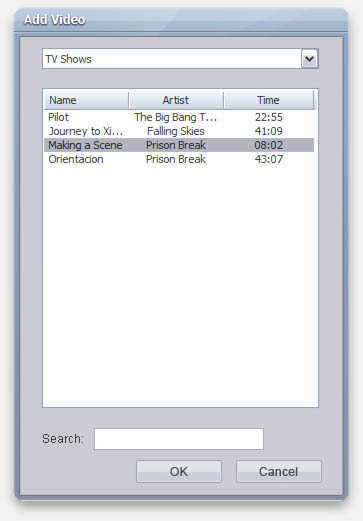 Select from the dropdown “Movies” or “TV Shows” and NoteBurner will query iTunes and display a list of available movies/shows. Click the movie(s) or show(s) you’d like to add – you can select multiple. Click “OK” when you’ve completed your selection. Movies and/or TV Shows that appear gray are not fully downloaded yet, so if that’s the case: go to iTunes, select “Movies” or “TV Series” and right click the movie or show you’d like to download, and click the “Download” option – you’ll have to wait until the download(s) have completed before you can remove iTunes DRM. The blue-ish progress indicator under the button indicates that a download is in progress. Click the “Convert” big button to start conversion. Conversion will go faster than realtime and just before conversion start you will notice that iTunes is being started (possibly in the background). I encountered once an error (code 1006) but closing iTunes and clicking “Convert” again resolved that. I’ve found the resulting file(s) to be in excellent quality and conversion goes reasonably fast so I consider this a good way to remove iTunes DRM from your movies and TV Shows. I’ve been using NoteBurner and it works well. The most advantage is compatibility. It can fully support the latest version of iTunes and mac. I hope it will keep up with dates so that I can enjoy iTunes rentals forever! Thanks for recommending, however, it can’t work with iTunes 12.3. Tried the plus version which has a different interface and works well with iTunes 12.3. I guess the NoteBurner plus version is much powerful than the standard version, however, the price is very close, one is $44.95, one is $39.95, I will surely choose the plus version instead. Thanks for the heads up … ! I can’t always track the latest and greatest with apps like these. I will try to find some time this week to see if I can test a newer version. Videos bought from iTunes, Amazon, Zune Marketplace, etc. are protected by the DRM and can only play on specified players. 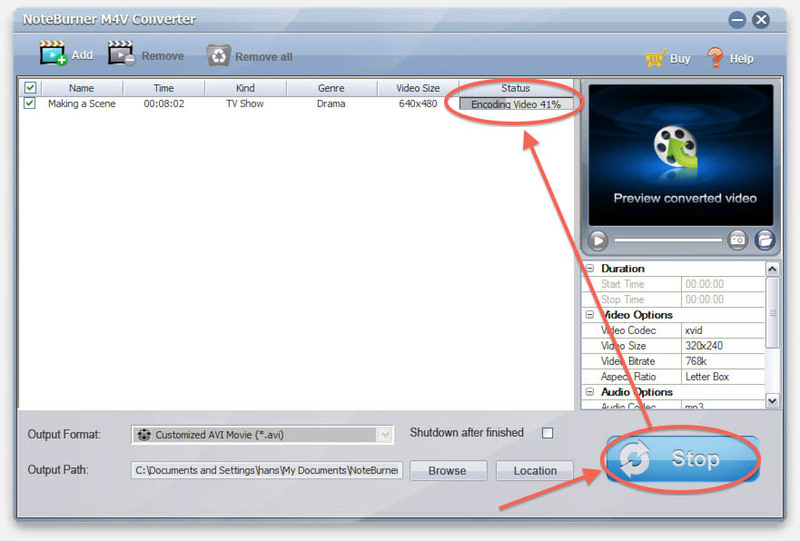 To convert DRM videos to non-protected files, you will need to use Aimersoft DRM Media Converter. It is an all-in-one DRM removal and video converter which is fully compatible with Windows 10. 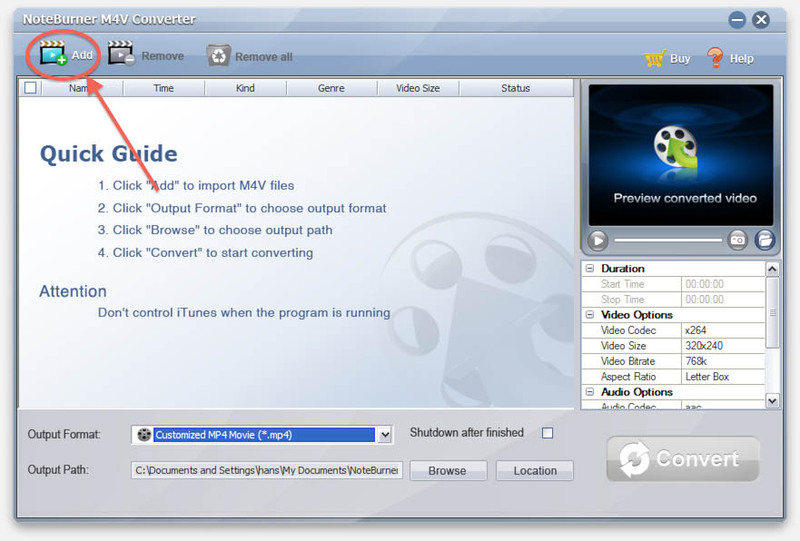 You can use this program to quickly convert M4V/WMV videos to MP4, MOV, MKV, AVI, etc. for playing on any device you like including iPhone, iPad, HTC, Samsung, LG, Blackberry, PSP, Xbox 360 and more. Thanks for the info – I’m sure some users will find this useful. Thanks for the useful tutorial!! Actually I have also been using a remarkable DRM remover and video converter: TunrFab iTunes M4V Converter. 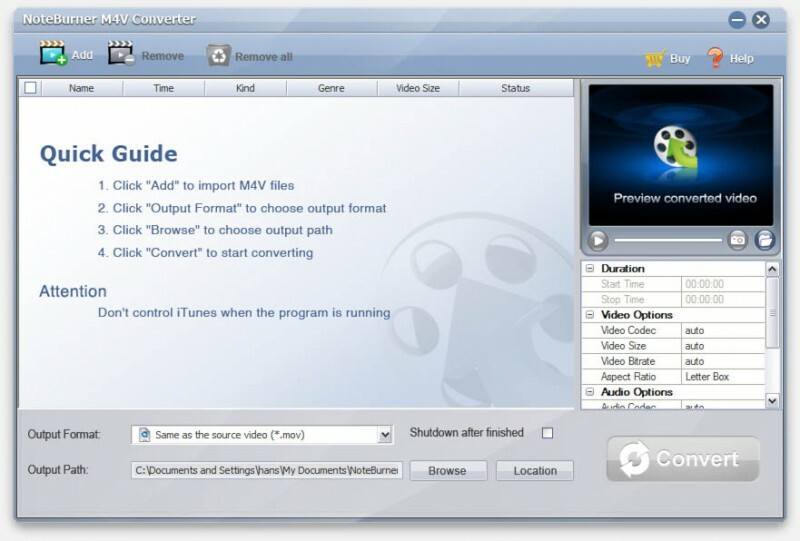 it can convert iTunes movies to MP4 or other video formats(removing DRM protection) without causing quality loss compared to the original videos. Moreover, it works perfectly on my Mac PC. 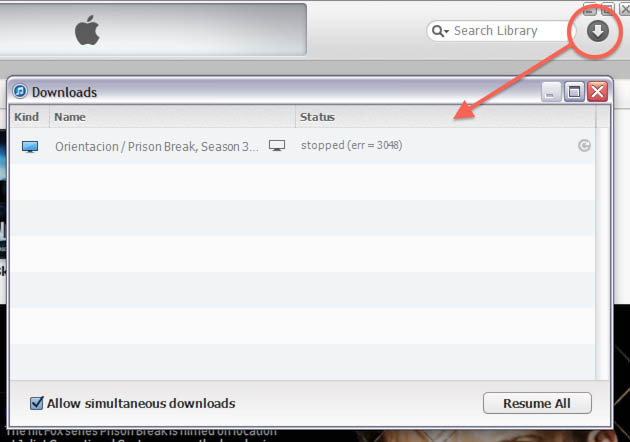 Guess what, it can also crack the 24/48 hours duration limitation of iTunes rental movies!!! Amazing!!! In my opinion, to remove DRM protection from iTunes movies on Windows, you need to crack DRM encrypted in all iTunes movies at first. We all know that iTunes movies can be played on Apple devices only. Tuneskit DRM Media Converter for Windows is the program for me to crack DRM protection from iTunes purchased and rental movies. After conversion, all these videos are lossless quality. You can enjoy non DRM protected iTunes videos and TV shows on Samsung TV, android phone, Windows PC and other devices freely. First of all, circumventing the DRM by cracking it is definitely in violation with the user agreement the user has with Apple. Thanks, nowadays it it nor a new think to remove DRM from iTunes movies, however, it is still really difficult to get lossless output video due to the deep encryption of the DRM protection. I feel so lucky to find the DRM Media Converter and the DRM Audio Converter for Mac to help me remove dRM from digital media files losslessly. The only downside is that iTunes keep updating, so I may have to update the software manually to make it work all the time.